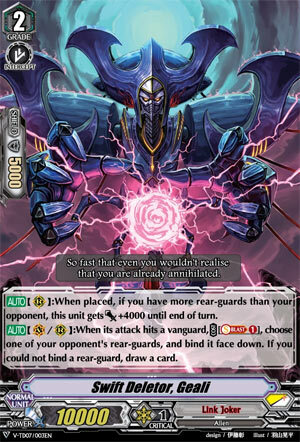 [AUTO](RC):When placed, if you have more rear-guards than your opponent, this unit gets [Power]+4000 until end of turn. [AUTO](VC/RC):When its attack hits a vanguard, COST [Soul Blast (1)], choose one of your opponent’s rear-guards, and bind it face down. If you could not bind a rear-guard, draw a card. The only other Trail Deck card that was remotely interesting. Geali here is not just a nice ride, generating an assured plus no matter what the hell happens, he’s also a means to make 20k+ columns to abuse with Delete. A bit sad he encroaches on Greion to some degree but hell, assuming you ride normally you got three shots maximum with these guys together and doesn’t eat Delete fuel, so there isn’t a lot of reason not to run this.